Three months after his inauguration, the Congressional Black Caucus eagerly responded with a 130-page policy document entitled “We have a Lot to Lose,” outlining legislation they say would help African Americans and similarly marginalized communities. 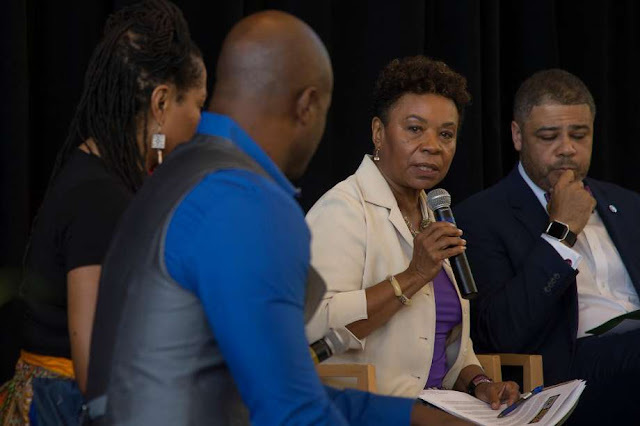 That request fell on deaf ears, Rep. Barbara Lee, D-Oakland, said Saturday at an annual “State of Black America” panel at Laney College. She encouraged people at the Making Connections event to “be at the table with the black agenda and demand those resources,” with or without help from the administration. “The Congressional Black Caucus is not only the heart and soul of the resistance movement in Congress but also leading on so many issues that we care about here in the Bay Area,” said Lee, a caucus member. The panel highlighted a number of concerns for the group of a few hundred people, predominantly African Americans, in the audience, including economic disparity between black and white communities, homelessness, housing struggles and criminal justice reform. Speakers at the Oakland event included Lee, San Francisco Supervisor Malia Cohen, Oakland Councilwoman Lynette Gibson McElhaney, Mark Ridley-Thomas of the Los Angeles County Board of Supervisors and National Urban League Vice President Don Cravins Jr.